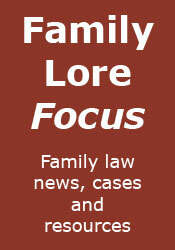 Should family lawyers specialise? - As suggested by Lord Sumption. A case of very great sadness and tragedy - London Borough of Brent v C.
Three points from a child abduction case - A detailed look at R v R.
MoJ survey on legal aid for domestic violence victims - If you can, please respond. You'll find it here.